DURHAM, N.C. -- Researchers from Duke University, the University of Cincinnati (UC) and the Durham Veterans Administration Medical Center are hoping to find a geographical pattern to help explain why 1991 Gulf War veterans contracted the fatal neurological disease amyotrophic lateral sclerosis (ALS) at twice the normal rate during the decade after the conflict. By layering military records of troop locations onto Gulf-area maps, "we've found there were some areas of service where there appears to be an elevated risk," said Marie Lynn Miranda, an associate professor at Duke's Nicholas School of the Environment whose group uses geographic information systems (GIS) to study environmental health problems. Also known as Lou Gehrig's Disease because it crippled and ultimately killed that baseball great in 1941, ALS causes cellular degeneration in the central nervous system. Its cause is unknown. "There are no reports on the occurrence of ALS among veterans of other conflicts," the researchers wrote. "There is only a single report that suggests ALS may arise from environmental exposures associated with military service, per se." The cases assessed by Miranda and her colleagues occurred within a group of people who are expected to be at low risk for ALS, because they're mostly under the age of 45. Miranda is the first author of a report on an initial analysis now published online in the research journal NeuroToxicology. The work was funded by the Department of Veterans Affairs Cooperative Studies Program. The report's senior author is Ronnie Horner, professor and director of the department of public health at Cincinnati, who led research that first documented twice-normal ALS rates among vets of the first Persian Gulf War in an article published in the September 2003 issue of the journal Neurology. Horner's group is now assessing possible exposures vets might have had in the Gulf region that could explain the higher ALS rates its 2003 study found. "As one of the largest contemporary set of cases, it presents a real opportunity to identify clues as to the cause of ALS not only for veterans of the first Gulf War but, perhaps, for ALS generally," Horner said. UC researchers are coordinating their investigations with those of researchers at the Durham, N.C. Veterans Medical Center and nearby Duke Medical Center. Another UC-led study, published in the July 2008 issue of the journal Neuroepidemiology, found that the risk for developing ALS has now decreased among 1991 Gulf War vets. That suggests that the cause or causes of the ALS had something to do with their deployment in the region between August 1990 and July 1991. Of the 135 cases diagnosed among the vets within 11 years after the war, only three had a family history of the disease. The small numbers might indicate that there is an environmental cause for ALS, the authors added. "In the one-year period of military operations, some deployed military personnel experienced numerous exposures to multiple, potentially neurotoxic agents," Miranda and coauthors wrote in the new report. "If the array of possible candidate environmental exposures could be reduced, it may be possible to identify or at least focus inquiry on specific potential causative agents." To narrow down the possibilities, Miranda and fellow investigators used GIS analysis, which allows researchers to layer different kinds of information onto maps to deduce potential risks. They began by searching Department of Veterans Affairs and Department of Defense records as well as other sources to identify military personnel diagnosed with ALS after 1991. Department of Defense data also allowed the researchers to identify the military units these veterans with ALS served in during their deployment to the Persian Gulf region. In a separate analysis, the researchers identified troop units known to have been exposed to emissions from a munitions storage area at Khamisayah, Iraq. 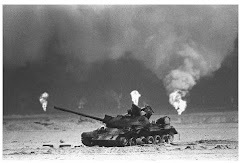 Those munitions were destroyed by U.S. forces in March 1991, and a United Nations commission later found many rockets there had been loaded for chemical warfare. A previous Defense Department modeling study deduced that "some 90,000 veterans may have been exposed to low levels of nerve agent" at Khamisayah, the new report said. The GIS mapping revealed that "there were some areas where there appeared to be an elevated risk," Miranda said. To narrow down the possibilities, she and co-investigators then used statistical methods that assess the "best guess about the likelihood that space matters" for each grid of Gulf territory, she added. Applying those statistics, the likelihood of a spatial connection with ALS development "climbed as high as 91 percent" in some grid cells, she said, most notably in a region southeast of Khamisayah. But Miranda cautioned that she will need to do additional analyses that add "time" to "place" before she can be more specific. 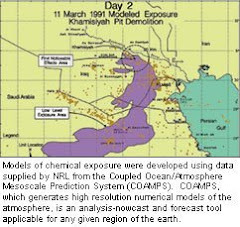 For instance, the researchers will want to know whether the ALS victim's units were in the path of emissions from Khamisayah on a specific day. Miranda and her colleagues are also interested in examining environmental exposures that may be associated with smoke plumes from oil well fires. Other authors of the new NeuroToxicology report include Miranda's Nicholas School colleagues M. Alicia Overstreet Galeano and Eric Tassone as well as Kelli Allen, a research health scientist at the Durham VA Medical Center and a Duke assistant research professor of medicine.